For nearly 25 years, Alimay Homes has built its reputation for excellence on a foundation of trust, service and integrity. 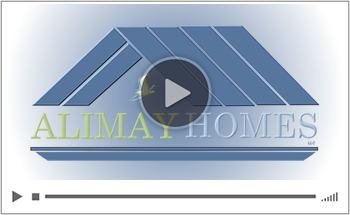 Alimay Homes specializes in the creation of custom single family homes built on your lot. We take great pride in offering innovative home designs that inspire our customers. Because we build a manageable amount of homes each year, we are able to maintain extraordinarily high standards of construction and customer service. But more importantly, we constantly strive to exceed your expectations, provide outstanding value, and above all, work with integrity and respect for our clients, employees and vendors. This is a very exciting time in your life. Building a new home is just another chance for you to express yourself. Our custom homes are built to reflect your unique Florida lifestyle. Whether you have always imagined a cozy cottage-like home or a large high-tech home, Alimay Builders can design and build the living space of your dreams. We have been working with our team of skilled subcontractors for many years, and you can count on us to build you an innovative home that matches your unique personality and lifestyle. View our Custom Home Gallery to start envisioning your own dream home! We are one of Floridas’ largest privately owned new home builders. We offer affordable new homes in Florida. Discover why people choose Allimay Homes. New homes located in Hillsborough, Pasco and Pinellas Counties, including: Tampa, South Tampa, Davis Island, Odessa, Westchase, Safety Harbor, Palm Harbor, Tarpon Springs, Clearwater, Seminole, St. Petersburg, Tierra Verde, Apollo Beach, Riverview, Valrico, Brandon, Plant City, Thonotosassa, Temple Terrace, New Tampa, Land O’ Lakes, Lutz, & all surrounding communities. Copyright © 2015 Alimay Homes. All Rights Reserved.